Nicky Clark grabbed four goals as Dunfermline ended a four-match winless run with a thumping 5-1 victory against a Dumbarton side that had drawn 2-2 in their previous three matches. Clark broke the deadlock by heading in Michael Moffat's seventh-minute cross. Sons goalkeeper Alan Martin made a great save to deny Moffat in a one-on-one situation in the 26th minute, but 60 seconds later Paul McMullan extended the lead with a great strike from the corner of the box following a neat reverse pass from Clark. Dunfermline made it three on the hour mark when Kallum Higginbotham's corner was headed home by the unmarked Clark off the underside of the crossbar and he completed his hat-trick with a close-range header from Lewis Spence's cross with just over 10 minutes remaining. 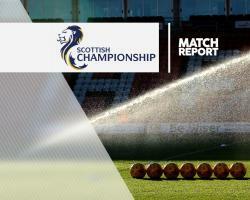 Clark scored his fourth and his side's fifth in the 84th minute with a neat finish at the far post, but Dumbarton had the last word as Daniel Harvie cut in from the left and his low shot went under the body of goalkeeper Sean Murdoch.